Looking for an easy DIY jewelry project? Here's a cute ring that's fun to wear for casual occasions. 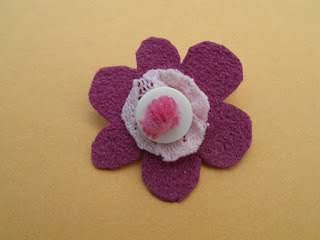 Although I made this ring with deep pink Ultrasuede, pink lace, a small ivory button, and ribbon yard varigated in shades of pink, it could be fabricated of any color. The bottom layer, which has the "petals," needs to made of some type of material that won't ravel, so skip any type of woven fabric for this layer, and use felt, faux suede, faux leather, real suede, or real leather. Although a fabric such as suedecloth doesn't ravel, it has too much drape to work for this ring project. The material chosen needs to have enough body to it so that it doesn't droop. A small button is also required--I used an ivory button that's 3/8" in diameter--as well as an 8-inch length of ribbon yarn. The first step in making the DIY fabric flower ring is to draw two patterns--one for the flower with petals and one for the middle layer. You can print this page and reduce the size of the flower to whatever size you desire. The ring I made was approximately 1 1/4 inch in diameter. 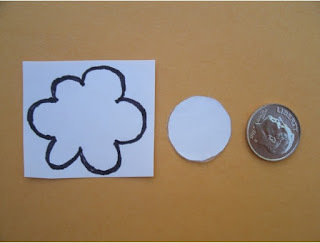 Draw around a dime coin to make the second pattern--the round one. Using a small scrap of faux suede and a small scrap of lace, tape the patterns to the wrong side of the fabrics and cut out the pattern pieces. Remove the patterns from the fabrics. The second step is to slightly gather the round fabric. 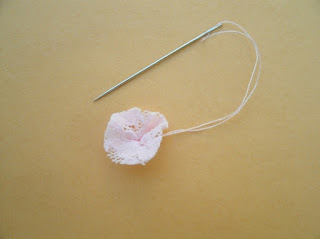 Using a hand sewing needle and thread that matches the lace, sew a running stitch in a circle about halfway between the center of the lace fabric and its edge. Pull up to form a few little puckers. Knot to secure the thread. Next, assemble the three layers of the "flower." 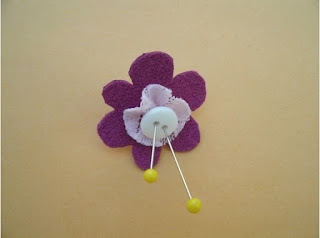 Use a small button with two holes in it for the top layer. A button with a shank won't work for this particular project. Hold the three layers in place temporarily with two pins through the button holes, as shown above. 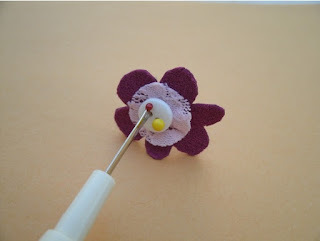 The fourth step in making the fabric flower ring is to poke two holes through the two fabric layers. These holes should line up with the button holes in the button so that the yarn can be threaded through all three layers and secured. I used the sharp point of a seam ripper to make the holes through the fabric. You could use the sharp point of embroidery scissors or an awl instead. 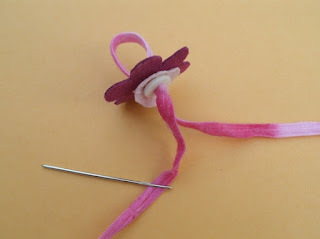 To finish the fabric flower ring, use a blunt tapestry needle to pull the yarn through all three layers of the fabric flower. Make sure that the eye of the tapestry needle is smaller than the button holes. Start from the top, go down and through all layers of the fabric, pulling the yarn through with the tapestry needle. Then pull the yarn back up through the other button hole, leaving a loop on the back. Now try on the ring and pull up the yarn so that it fits properly. If you can tie a knot with one hand, leave the ring in place on your finger and tie the two ends of the yarn in a double knot. Get someone else to tie it if it's too difficult to maneuver with one hand. Trim the ends of the yarn close to the knot, taking care not to cut the knot itself. Secure the cut ends of the yarn with a drop of clear-drying craft glue. Allow a few minutes for the glue to dry, and you're all done. Enjoy your fabric flower ring!